It was 498 years (and three days) ago, in October of 1517, when Martin Luther nailed his 95 Theses to the castle church door in Wittenberg, Germany. That event sparked the Protestant Reformation, as people throughout Saxony and the rest of Western Europe took a stand against the corruption and error of the medieval Roman Catholic Church. As for Luther, he quickly became a wanted man. Just a few years later, after a series of debates and confrontations, Luther was issued a bull of excommunication by Pope Leo X. It was June of 1520. Luther was given 60 days to recant. Instead, he took a copy of the papal decree out into the center of Wittenberg and burned it as a public demonstration of his resolve. When news reached Rome that he was unwilling to change his views, Luther was officially denounced by the Catholic church. Shortly thereafter, the German Reformer was summoned to defend his views before the Holy Roman Emperor, Charles V, who at that time was the most powerful ruler in Europe. Because there was no separation of church and state, European governments were often directly involved in the punishment of heretics. 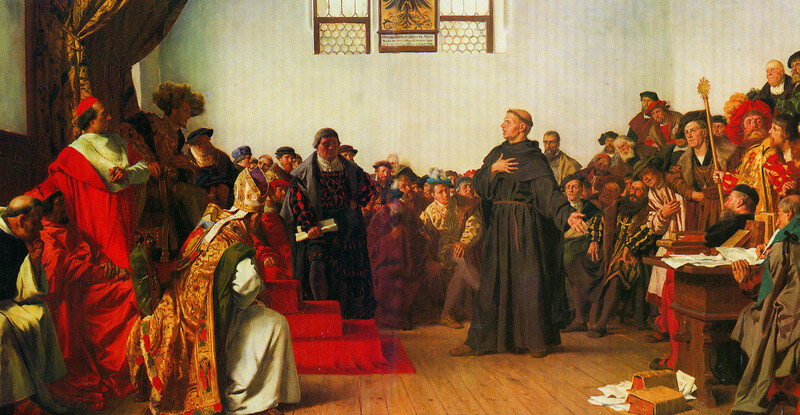 Luther knew that if he was convicted of heresy, he would likely be sentenced to death just as John Huss had been a century earlier. The imperial council, known as a Diet, met in the city of Worms. Luther arrived on April 16, 1521 and appeared before the assembly the following day at 4:00 in the afternoon. A stack of his books was presented, and he was asked if he would recant the alleged heresies they contained. Luther, knowing what was at stake and wanting to make sure he answered in a way that was both accurate and precise, asked for more time. He was given 24 hours. As those words indicate, Luther was willing to take a bold stand, putting his life on the line for what he knew to be true, and doing so in the presence of the most powerful ruler in Europe and in the face of a corrupt religious system that often responded to its detractors by burning them at the stake. What gave Luther that kind of boldness? My God, stand by me against all the world’s wisdom and reason. Not mine but Yours is the cause. I would prefer to have peaceful days and to be out of this turmoil. But Yours, O Lord, is this cause. It is righteous and eternal. Stand by me, O true eternal God. In no man do I trust. Stand by me, O God. In the name of your dear Son, Jesus Christ, who shall be my defense and shelter, yes, my mighty fortress, through the might and strength of Your Holy Spirit. Amen. As those words indicate, Martin Luther could stand before a human tribunal because it was God who stood by Him. He was strong in the might and strength of the Holy Spirit. His fearlessness came from the fact that Jesus Christ was his defense, his shelter, and his mighty fortress. It would be several years later, probably in the fall of 1527, that Luther penned his most famous hymn, “A Mighty Fortress Is Our God,” which, of course, emphasizes those same truths. That particular year, Luther became very sick. A short time later, the plague came to Wittenberg, causing many of his friends and even his son to become very ill. Luther found himself in a time of deep discouragement that bordered on despair. Whether hardship came in the form of political pressure (from Roman Catholic forces that sought to kill him) or from personal trials (like enduring severe illness), Martin Luther found comfort and courage by looking to God as his refuge and tower of strength. The same perspective ought to be true for us. Those who know the Lord, love Him, and belong to Him need not fear. Though the mountains tremble and collapse into the sea; though kingdoms rise and fall; though wicked men flourish; though our lives are but a breath; and though we are frail vessels; we need not fear for our hope is in God. He is our tower of strength; our Rock of defense; our fortress; our safe haven in the midst of danger; our guide in the midst of uncertainty; our anchor in the storm; our hope for today and tomorrow; and our loving heavenly Father. No one can take us out of His hands; nor can anyone or anything separate us from His love in Christ Jesus. God is on His throne. He is in control. He is our mighty fortress, and we can find refuge in Him.